I’ve had a number of inquiries for an alternate Spirit of Sam power system. I worked out a system for Phil Pearce. He’s had a chance to do some run time and amp draw tests. Here are his comments thus far. Phil Pearce and his 5 ounce Wren Spirit of Sam competition model. 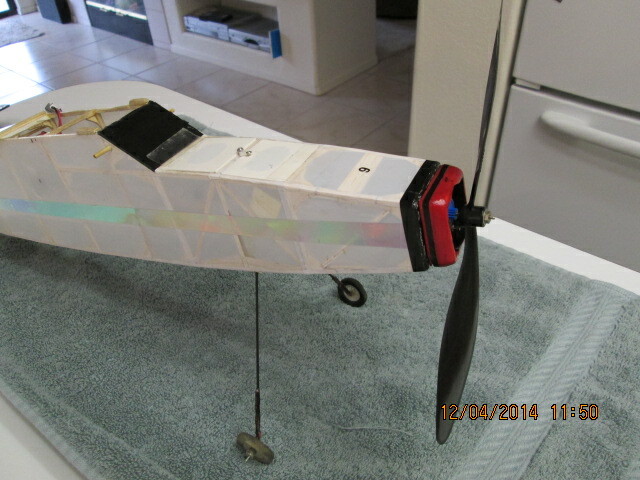 Equipment is a 4000kv 12mm Afterburner with 1.5mm shaft. Running in a GWS LPS gearbox 4.8:1 ratio. 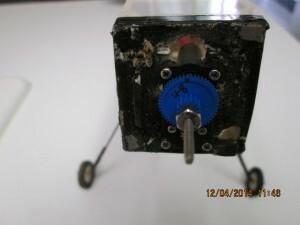 Close up of GWS LPS gearbox with Afterburner motor installed. 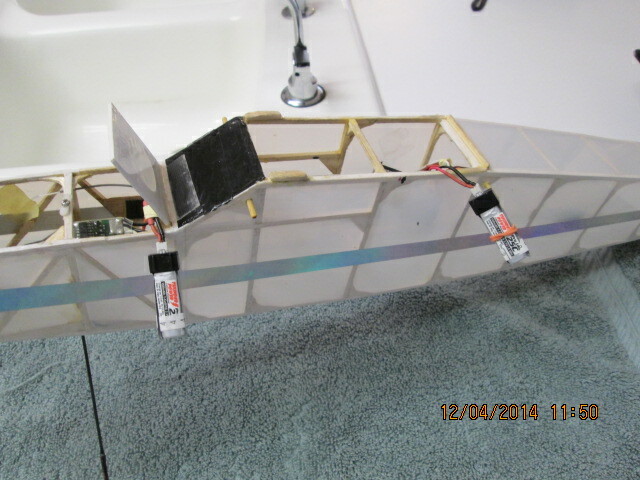 Side view motor and RX battery. Some thoughts that I have based on what I know thus far: An “A” ratio (less reduction) could be considered in order to reduce the pitch or perhaps the disk diameter. That might lead to a 9-4.7 or 9-5 or 8-6 being optimal. 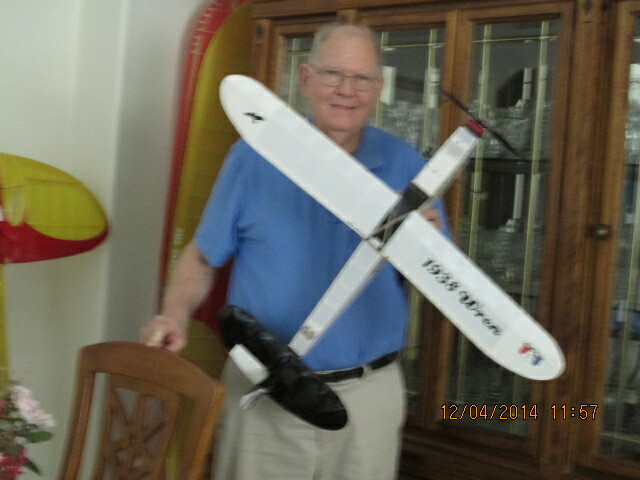 I’m tickled by the idea of a 4 or 5″ high rpm setup in order to try and get the model to glide with a stopped prop longer than Phil reports with 9″ props. Not being experienced in the competition, my thoughts might be completely off base here. The higher KV Afterburner motor should be avoided because the higher no-load current. Although it might be more efficient at wide open throttle, the minimum no-load current would kill you in cruise (partial throttle flight). So, the lesson is stick to the 4000kv motor. Anything you can do in this contest to utilize a low non-load current motor would probably be an advantage over most motors with higher no-load currents. The no-load current rating is one of the fixed parameters (motor constants) of every motor. Explaining it fully is beyond the scope of this article. 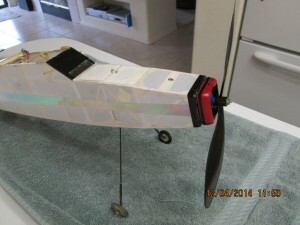 This entry was posted in Blog Entries and tagged afterburner, AMA, Brushless, cell, competion, duration, geared, Motor, of, pearce, phil, SAM, single, spirit, spirit of sam, wren. Bookmark the permalink.